The first night of Hanukkah begins Sunday evening. Jewish families all over the world will begin the holiday after nightfall. Traditionally, Jewish families will light the first candle of their Menorah on Sunday after nightfall, as they light the candle they will say three blessings, every night from then on they will recite two blessings. The Menorah has 9 candles, 8 for the 8 nights of Hanukkah and one to be used to light the others. Hanukkah is a very beautiful and meaningful holiday in Judaism. It commemorates the the rededication of the Second Temple in Jerusalem during the Maccabean Revolt. If you and our children would like to learn more about Hanukkah you may want to check out this child-friendly history. This month we want to highlight a book that talks about Hanukkah and what it is like to celebrate it during a time when other religions are also celebrating their holiday. Hanukkah happens in November or December depending on the Gregorian Calendar. 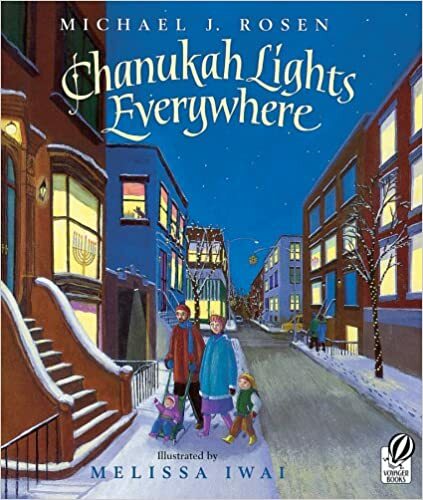 This means it can occur before, or during the Christian holidays.The book, Chanukah Lights Everywhere follows a brother and sister through their celebration of Hanukkah, and shows how they notice all of the other celebrations going on around them. The book shows how the many different celebrations are all happening and at once and how they each bring joy and love to their respective followers. It shines a light on the importance of respecting cultures, religions, and allowing for each of them to coexist in peace. This is an excellent book for teaching about not just Hanukkah but also about cultural acceptance and respect. It is an excellent book for the holidays, no matter which holiday you are celebrating this season. This entry was posted in Learning, reading and tagged best books, chanuka, Christmas, hanukkah, holiday books, Holidays, holidays stories, learning, lights, Reading, the boys store on December 1, 2018 by Lacy.